Apparently this is pigs trotters..where are the claws? When we entered Arbutus there was a funny smell that I couldn’t recognize. We hadn’t booked so we were sat at the bar. 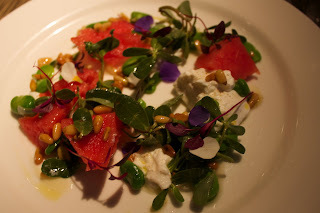 I’ve never been to a Michelin-starred restaurant before, Arbutus has one star. I was excited. 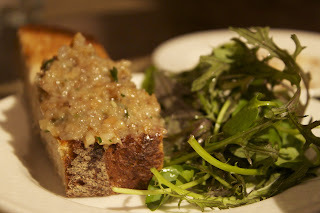 Most reviews by vegetarians are of vegetarian restaurants. But vegetarians often have ‘normal’ friends, and we eat out with them. The reality for most vegetarians is that they are obliged to eat in non-vegetarian restaurants. So I do reviews of meat restaurants and let you know if a vegetarian can eat well and feel comfortable there. Arbutus does have a couple of salads for veggies in the starters and a risotto dish in the mains but fundamentally this is a meat eaters restaurant. I fully realised this when my friend Fat Les got his main course of tripe with pigs trotters. When they lifted the lid of the little copper pan, a really intense smell escaped, the same smell that I noticed on the way in. The odour of tripe is a mix of sweaty cheese, body odour and dead flesh. I almost heaved on the spot. It’s overwhelming. You could see little pieces of skin, stuffed intestine and chopped pig’s foot. I had really bad fibroids a few years ago, I had surgery to remove them. They caused me years of pain, so huge that I couldn’t even lie flat on my front. As soon as I woke from the anaesthesia I asked to see them. The doctor brought them in a bucket. The fibroids were huge, one had a stalk, like a massive flesh coloured cherry. Another was cut open. The inside looked exactly like Les’ dish of intestines. The thing I liked about Arbutus was that they had a carafe of wine for £5. Incredibly reasonable and true to chef Anthony Demetre’s French bistro leanings. Mains was a spring vegetable risotto with soft herbs. There was no other option for me. 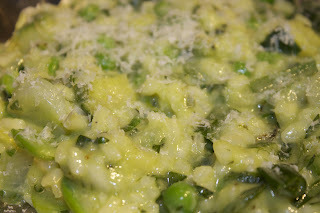 The risotto was very green with broad beans (again), courgettes and spring onions, soft herbs is a little dish of parsley etc. It was well cooked but nothing special. I asked for extra Parmesan to give it kick. Puddings: I had the iles flottantes with pink pralines. It was one large ile flottante, like a very soft meringue, in a pool of creme anglaise. Fat Les had trifle. Both were nice competent bistro food but no wow factor. I got talking to our neighbours at the bar. You see, even when I’m not at a home restaurant I start talking to other people in restaurants whether they like it or not. One of the guys was a barrister, the other was an undertaker. They come regularly to Arbutus, they really like the food. For a Michelin star restaurant it’s not outrageously expensive but I wouldn’t go back. The food was good but it’s not a restaurant for vegetarians. You can tell the chef’s heart is not in it. In fact he’d probably prefer it if there was a heart in it. #*%x!%# fibroids, people like you give tripe a bad name! A gross misunderstanding! Right next date, Stokey Newton; I'll be having sheep's eyes and boll**ks and you can have my flat bread. I wasn't a fan of Arbutus when I went. I didn't realise it had a Michelin star and didn't think the food really merited it, either. I like what they do with the wine, but I haven't been back. Isn't Barrafina on the same road? I'd rather go there every time, even if it was just to eat the tortilla. As an eater of the flesh, it does sound tempting…(not the fibroids)…Wild Honey is definitely on my list to visit. Need to put more effort into getting through said list! FL – are you a fan of SJ Bread and Wine? Your description at the end reminds me of there. I love tripe, though I've never had it cooked the European way, only Chinese. The tripe is usually cooked in strong flavours, such as steamed with spring onion and ginger, or braised in 5 spice. A much more pleasant smell. Are you Les? Might I accompany you? Or is it all innards and the like? But I have a broader question…did you work your charm, Ms. Marmite Lover, and attempt to have the chef make you a little something different? 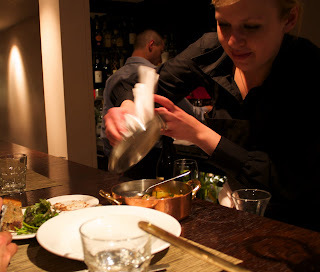 I've only been to Arbutus once but I thought the service was excellent and very accommodating. 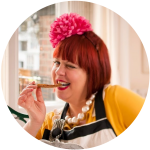 Should you return (or should you find yourself in a similar situation again), bat your lashes and see if the chef can whip you up something just for you. Maybe Krista but I wasn't crazy about the service either. One of the waiters stuck his elbow in my face when clearing my dish. I did find that a bit odd at the time and then I was reading Jeffrey Steingarten's The Man who Ate Everything (brilliant btw)about going to waiter's school. You simply aren't supposed to do that, especially in a Michelin star restaurant.